This is not the usual thing for an ordinary citizen to have in their front yard around here. But with Jesus Christ in your heart, a person can tend to dream big. God gives ideas that seem impossible. But if we can believe and not give up, we just might see those dreams come true! I’ve introduced you to my friend Hadiza before. (Though it has been awhile!) Hadiza and I met the first time we lived here in 2012-2013. She is truly a woman of faith! For this snapshot, I want to show you her most recent dream-come-true. Hadiza dreamed of having clean water for her neighborhood. The nearest well is an open well, which means the water is dirty and anything at all could fall into it (animals included!) to contaminate it. This water causes sickness and is physically difficult to get enough daily water for each family in the whole neighborhood. The nearest clean water well is so far away that a person would need to have a donkey cart to carry the water such a long distance! Hadiza prayed for God to give her a well. She mentioned this dream to a few people, but she had to wait quite a long time for it! She told me “I really want to have this well to share with my neighbors, and I can tell them that this is not my well, this is God’s well and He wants to bless us. I want this well to be a way to show people that God loves them!“ Of course these words flow out of her mouth and then she finishes with that gorgeous smile! Hadiza told me that when they struck water and the first clean cup of water came out of the spout, they gave it to the oldest lady in the neighborhood. This muslim woman drank it and began dancing around and praising God! Every day now, the people start arriving early in the morning to gather their clean water from God’s well. So, I wonder what dreams God has given you and me? Let’s start BELIEVING! 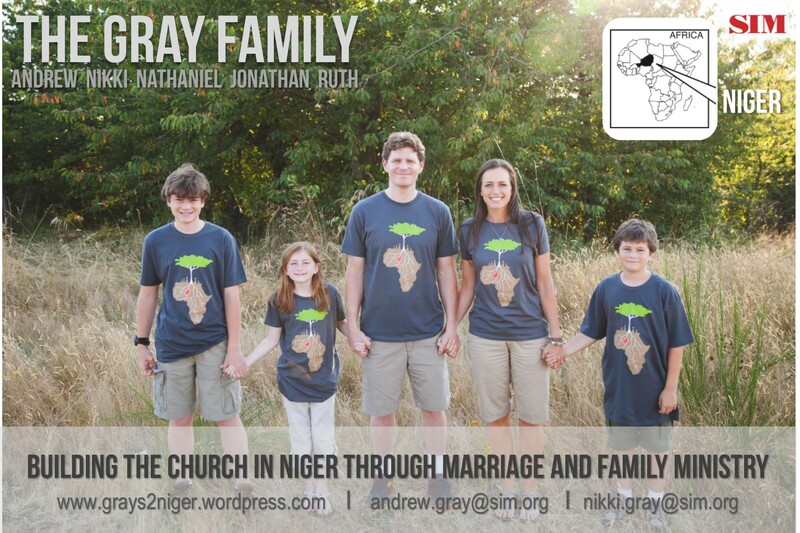 Before I came to live in Niger, I had no idea what the church was going to be like. Did they meet in buildings? Did they have chairs or pews? What kind of music did they play? What instruments? Etc. As you can probably guess, here in Niger there are all kinds of church families – denominations, sizes of churches (#’s of people), sizes and types of buildings, styles of worship and preaching…you get the idea. The Christian churches here are relatively young and undeveloped. I haven’t officially researched church-growth-facts-and-figures, but I can tell you that there is a beautiful simplicity to the church here. It’s not perfect, no way! There is plenty of room for growth – in fact, that is why we are here! We aren’t planting a new church. We came to encourage the believers who are already doing their best to live out their faith in this predominantly musl!m country. I thought you might wonder what our church actually looks like here? A page out of the songbook – we sing this song to end our service every week. Enter the words in to google translate & you might recognize this song from the 1990’s! Well, that is just a snapshot for you – but now you can envision at least one of the church families here in Niamey. I wonder if anything surprised you? Let me know! Or maybe this snapshot prompted some questions you have about the church here? Feel free to reply to this email, or send an email to nikkigray3@gmail.com.